In our ongoing effort to provide benchmark data to help you choose the right iMac, we now present test results from a 21.5-inch 2.7GHz Core i5 iMac with a 256GB solid-state drive (SSD). You can use these results to compare with the standard-configuration iMacs and two build-to-order (BTO) models with Core i7 processors. The iMac we ordered adds a 256GB SSD to the standard-configuration $1499 21.5-inch iMac ( ), which includes a 1TB hard drive. The $600 SSD upgrade brings the total cost of this iMac to $2099. Apple doesn’t offer SSD options on the entry-level, $1199 21.5-inch 2.5GHz Core i5 iMac ( ), so the model we ordered represents the least expensive iMac available with both an SSD and hard drive. If you opt for a 256GB SSD only (no hard drive), this adds $500 to the $1499 price of the standard configuration. Longer bars are better. Blue bars in italics represent reference systems. Macworld Lab testing by James Galbraith, William Wang, and Mauricio Grijalva. As we’ve experienced in past lab testing, SSDs are considerably faster than the standard 7200-rpm hard drives. In our overall system performance test suite, Speedmark 6.5, the SSD-equipped iMac outperformed the 21.5-inch 2.7GHz Core i5 iMac with just a 1TB hard drive by nearly 15 percent. The SSD-equipped iMac was 35 percent faster when duplicating files, 8 percent faster when compressing files and 47 percent faster uncompressing files. The SSD-equipped iMac was also 14 percent faster when opening a Word document in Pages, 42 percent faster when importing JPEGs into iPhoto, 9 percent faster at importing and processing photos in Aperture, and 16 percent faster importing a two-minute clip into iMovie. As you might expect, processor or GPU intensive tasks, like those performed by Handbrake, Cinebench, MathematicaMark, and Call of Duty 4, didn’t reap any benefit from the SSD upgrade. 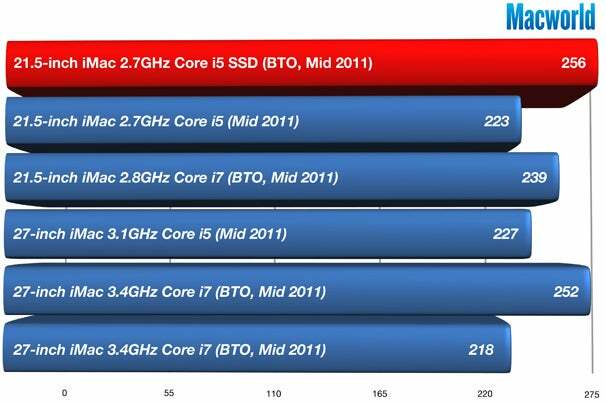 In overall performance, the SSD-equipped iMac posted higher Speedmark 6.5 scores than the 2011 BTO iMacs with processor upgrades. The SSD-equipped iMac even posted a higher score than the previous fastest iMac, a 2011 BTO 27-inch 3.4GHz Core i7 iMac with a 1TB hard drive. Comparing the SSD-equipped iMac to the BTO 21.5-inch 2.8GHz Core i7 iMac with a 1TB hard drive, we see that the SSD iMac was about 7 percent faster in our Speedmark tests. Processor test results tell a completely different story, however, with the 2.8GHz Core i7 iMac posting 18 percent faster Handbrake results, 25 percent times Cinebench CPU test results, and a 24 percent higher MathematicaMark score. Results in the above chart are in seconds; lower is better. Reference models in italics. Best result in bold. Call of Duty 4 results are based on framerate; higher results are better. All other test results in the above chart are in seconds; lower results are better. References models in italics. Best result in bold. Cinebench R11.5 braphics results are a score; higher results are better. All other test results in the above chart are in seconds; lower results are better. Reference models in italics. Best result in bold. MathematicaMark 7 results are scores; higher results are better. All other test results in the above chart are in seconds; lower results are better. Reference models in italics. Best result in bold. Behind the screen of a 21.5-inch iMac. If you get an SSD, the drive is installed underneath the optical drive. The 256GB SSD in our 21.5-inch 2.7GHz Core i5 iMac. 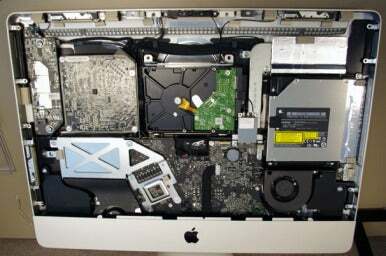 When you order an iMac from the Apple Online Store with both an SSD and a hard drive, the SSD is hidden under the optical drive. 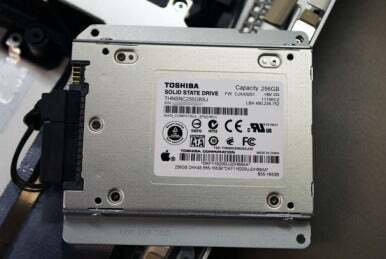 The cables and bracket used to keep the SSD in place are not included in iMacs purchased without the secondary drive. As we’ve previously reported, the iMac is not built to be easily user-serviceable and the hard drive replacement process is not recommended for the casual user. Check back soon for more iMac results, including an “ultimate” iMac configuration with the fastest available processor and SSD. If you have tests you’d like to see us run, let us know in the comments.